The strategies I learned as an assistant in a math rehabilitation classroom in an alternative school years ago are strategies that I use to this day. I believe wholeheartedly in learning the basic math facts. I believe in drill! Drill for the skill! My third grade student is in my math boot camp this year. If all we accomplish this year is learning the basic math facts and learning them with speed and confidence, I am very confident that this foundation will ensure success for future abstract skills. If your student is struggling with math, if they falsely believe that they are “bad” at math, it could be that math facts drill is just what they need to regain a sense of accomplishment and confidence. Below is a list of where to start…this is how I progress through the basic facts of addition and subtraction. In a later post I will share some great tricks to learn the multiplication and division facts quickly and with a bit of fun! A creative way to make your own set of fact family flash cards is to pick up the paint sample cards at a home improvement store that have four colors. Write each fact from the fact family on the 4 different colors. If you were to make all the fact families from 1 to 18 in this way that would mean you would need about 100 paint samples. 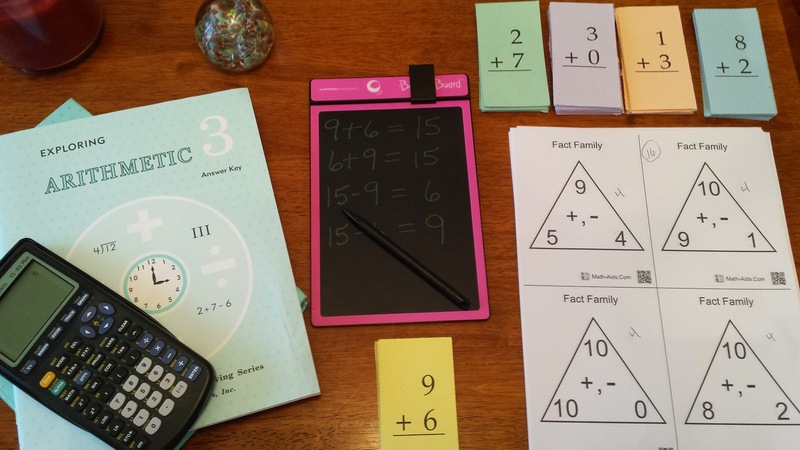 Fact family paint sample flash cards can also be used for multiplication and division facts. No time spent learning these basic skills is ever wasted. It can be fun, and it definitely improves a child’s attitude when they know their stuff! Here are a few helpful resources I have found.